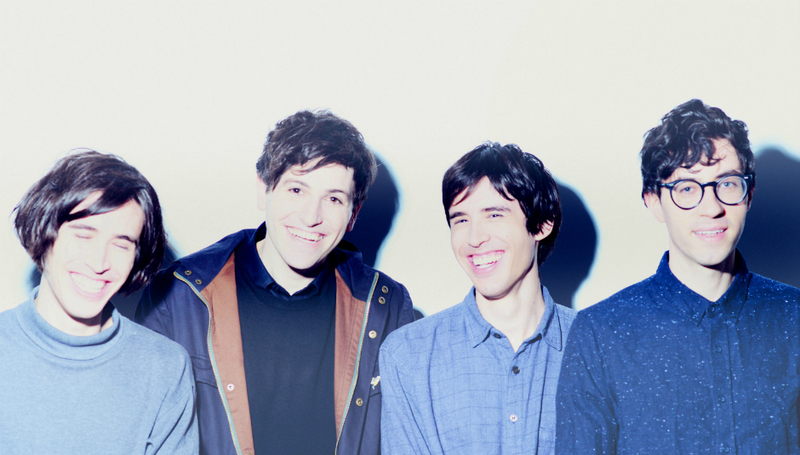 DiS Meets The Pains Of Being Pure At Heart: "I was frustrated we couldn't sound like Taylor Swift"
That’s what The Pains Of Being Pure At Heart promised on their theme song and now they only have one original band member remaining. DiS meets Kip Berman in London on the last date of his band’s recent world tour. Having seen everywhere from Ghent to Louisville over the past three and a half months, he’s exhausted but possessed by a fervent stream of conscious. After Days Of Abandon, the fanboy turned frontman has plenty to reflect on. Pains’ third album of bittersweet indie-pop coincided with the departure of keyboardist Peggy Wang for Buzzfeed, while longtime drummer Kurt Feldman isn’t touring the record. Delve beyond its many shimmering hooks and the LP isn’t all that cheery either. Songs like ‘Life After Life’ and ‘Until The Sun Explodes’ reference love and mortality as though they’re all too familiar bedfellows. Despite this Kip remains great company. Still chuffed that Caesar from The Wake came to his show in Glasgow and completely bemused by the Mrs Brown’s Boys D’Movie posters that are plastered around town, his enthusiasm for being in a band is utterly infectious. If Berman has his way, Pains won’t just endure as they pledged seven years ago - they’ll thrive. Being in Pains always seems a lot like wish fulfillment. You wanted to be in a band, onstage in front of fans and then you were. How has that changed since the first album? I don’t feel it’s any different. I wake up each day and I get to be in my favourite band and it’s wonderful. I get to write songs and go on tour with my friends, it’s very real but I love it more than anything. You always make it seem like being in a band is a very easy thing to do. For other acts it seems like a lot of strife is involved. Well maybe some of those people in those bands should get a job and then they’ll realise what they do is a lot more wonderful than what 99.9% of what people have to do by necessity each day. I’ve done other things. I’ve worked in call centres and stuff. It’s pretty night and day in terms of what brings you happiness. Of course there is always hardship in life, and there a lot of struggles artistically trying to push yourself into doing something of worth. If your first record was the Black Tambourine album and the second was your Smashing Pumpkins album, what does that make Days Of Abandon? What band do we rip off more than any other on this record? I think of it more as a chance to reset the dial and refocus on what it is about music we love. With the last album, which I still think is very exciting and different to what we did on the first album... maybe the preoccupation became too much the sound of the record and not the songs of the record. For me at least with songs, you should be able to pick up a guitar and someone should be able to sing along. So why did you focus on that with Belong? I loved making the first record but I felt people made so many assumptions about who we were. That we were somehow obsessed with wearing cardigans and crying into our diaries somewhere in Glasgow in 1987. I’ve always defined our music as pop and our music as pop, and our sense of what pop can be is very broad. Rihanna is pop but to me The Ramones are very pop. The things that unite music in terms of the immediacy and the memorable quality of the song is what’s important. I feel like I don’t need to apologise for writing 10 songs between three and four minutes and putting them on a record. The sound of our records is definitely conventional, pushing towards an ideal and not the periphery. There are a lot of coded references and in-jokes in your lyrics. Do you write them for yourself or to be poured over? I don’t mean to be obtuse, but there are things that I want to say and they may only entertain myself. There’s a line in ‘Come Saturday’, “A wasted summer with no drummer”, and I wrote that because we didn’t have a drummer and were most just wasted or maybe we were wasted because we didn’t have a drummer. I have to feel happy about what I write first of all and just hope other people can relate to it. I’m always surprised that people from different backgrounds find something that is relatable in our music. It seems like with Days Of Abandon there’s a strong contrast between happy songs and sad lyrics. That must have been deliberate? Yeah. I think if I wrote music as maudlin as the lyrics, people would jump out of the window by track three. The period inbetween Belong and writing this record was a very strange time. To see people that I’d played music with for so long, and still consider them to be my closest friends, fall away and not want to make music together. I still love them deeply and appreciate the time we had together. We were able to do such wonderful things, far beyond what any of us had dreamed was possible. It was hard to see people wanting to give that up and this band that I started being reduced to just me. It was lonely… but so long as I wasn’t destroyed this band wasn’t destroyed. That doesn’t mean I’m great, only if I don’t give in it can continue in another way. Did you considered doing Days… as a solo album? The Pains Of Being Pure At Heart is my ideal. I believe in The Pains Of Being Pure At Heart. It’s something beyond who I am. I have a lot of things that are not what I’d like to be at myself, but with Pains I can put all the good things in my life into something that’s beyond myself. I know it sounds silly, but I almost feel like it could be a franchise. Some kid could be like, ‘I’m going to start a Pains Of Being Pure At Heart and he could get together with his friends and write songs that felt like The Pains Of Being Pure At Heart to him or her.’ It wouldn’t be the same, but it would be an equally wonderful idea. Is ‘Kelly’ about Kelly Pratt from Beirut, who played horns on Days…? No but Kelly Pratt really enjoyed recording it. He actually put this really amazing saxophone solo at the end that never made it onto the record because my dear friend [Andy Savours] who produced it said he couldn’t in good faith let us do it. I feel like now that was still the wrong choice, but I trust that he knew. Have you ever considered ghostwriting for someone else? We feel like you’d do a good Taylor Swift? There was a one song that made the B-side that was a lot more Taylor Swift sounding than anything on the record called ‘Your Poison Touch’. I think we’re going to do an EP of songs that didn’t make the record, because I like to keep them short. Whose idea was the animated ‘Until The Sun Explodes’ video? When I was little and growing up my favourite cartoon was Jem and the Holograms. I didn’t really want ‘Until The Sun Explodes’ to go on the record, but the label did so to make it up for it they said, ‘We’ll let you make whatever video you want’. And animation isn’t cheap, so I was really thrilled at the way it turned out. Most videos you do, you feel embarrassed about them; it’s a very self-conscious thing. I know some bands go on and Say ‘we hate all our videos’. I love that Oasis documentary where they watch all their old videos and it’s hilarious. Suede had a similar one… I like the idea of playing an ideal of our band without having to physically be part of it. What’s your favourite Felt song, seeing as you reference them on ‘Art Smock’? Probably the last one [Me And A Monkey On The Moon], just because of how personal and vulnerable it feels. ‘I Can’t Make Love To Anymore’ is so not what you’d expect a Felt song to say. It’s really human and you can hear it unravelling as someone confronts their own artistic mortality and realise that all their dreams never came true. It’s almost like a supernova where they let the guard down a bit. They’re a great underappreciated band. It’s almost a cliché that they’re almost famous for not being famous or wanting to be famous but never achieving it. That narrative is interesting but what’s interesting about them is that they created a decade’s worth of incredible records. You’ve said said in the past you can ‘sing three notes really well’. What else are you good at? I’m really good at the arcade game Galaga. It’s an 80s arcade machine made by Midway where you’re a ship and you shoot these little bugs that come down. Pac-Man frightens me because I hate being chased and I don’t like being chased into corners. It’s a little too stressful for me. I’m someone who likes video games but I’m not that good at them. I probably spent most of my undergraduate years in the ping pong room playing Galaga and making sure all the high scores said ‘KIP’ and thinking that was really cool. Kurt our old drummer had a version of the machine that he moved into the studio where we recorded the album with my friend Danny. The producer literally hid the power chord for it because I was too preoccupied with playing the Galaga machine instead of recording the parts to the album.